A fisherman walks through the watercraft inspection with a NYSG Launch Steward pointing out key areas to look for aquatic hitchhikers. Credit: Brittney Rogers. 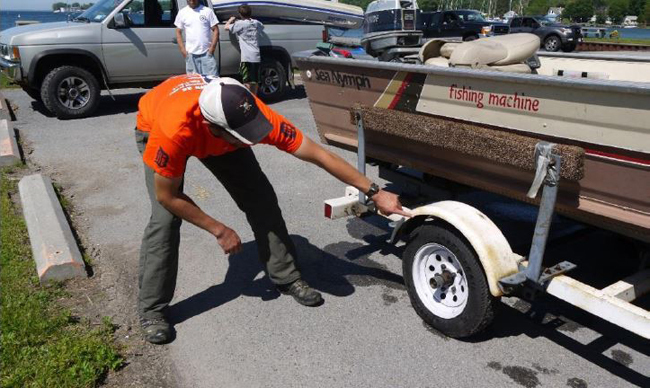 Geneva, NY, January 10, 2019 - New York Sea Grant will hold its 2019 Watercraft Inspection Program Leader educational webinar series beginning on January 17. The four webinars will address issues associated with recreational boating as a key pathway in the spread of aquatic invasive species. Mary Austerman, the Community Development Specialist with New York Sea Grant and author of the New York State Watercraft Inspection Steward Program Handbook, said on Thursday’s Finger Lakes Morning News watercraft inspection is a critical contributor to limiting the spread of AIS among the more than 7,000 lakes, ponds, and rivers in New York State and elsewhere. The webinars will be held from 10:00 am to 11:00 am on four consecutive Thursdays. They are free but registration is required. More information is available at the NY Sea Grant website or by calling 315-331-8415.